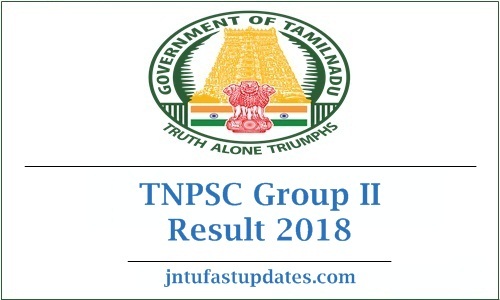 TNPSC Group 2 Results 2018, Selection List Download: Tamil Nadu Public Service Commission (TNPSC) organized the Group II written test on 11th November. The examination was held in many examination centers across the Tamil Nadu state. The organization has conducted the examination for more than 5 lakh competitors this year. Combined Civil Service Examination Grade II (CCSE II) examination was held with all the necessary arrangements. Tamil Nadu PSC has released the answer key for the Group II examination after completion of the test. Aspirants competed for the test have checked with the answer keys and estimated their score in the examination. Candidates competed for the TNPSC Group II examination can download the result shortly from the official website, tnpsc.gov.in. Candidates competed for the examination can wait to check the result date. Tamil Nadu Public Service Commission is the Tamil Nadu state’s functional authority that recruits manpower for various associated organizations of it. Annually the organization releases notifications for various posts. This year TNPSC notified 1199 Group 2 Posts. The vacancies include Sub-registrar, probation officer (prisons department and social defense department) posts. Aspirants having the suitable eligibility standards for TNPSC Combined Civil Services Examination II (CCSE II) have applied for the announced posts from 10th August to 9th September 2018. The selection of suitable aspirants will be done through the preliminary examination, mains examination, and interview rounds. All the competitors clashed for the Tamil Nadu Group II examination can check the latest updates from the TNPSC official website, tnpsc.gov.in. The Tamil Nadu Public Service Commission is expected to release the result after 3 to 4 weeks of the examination (approximately). Hence candidates have to stay patient until the result date is announced. Or the competitors can check our page for the latest updates. The candidates whose Register Numbers are mentioned below have been provisionally admitted to the Main Written Examination for appointment by direct recruitment to the Posts Included in Combined Civil Services Examination- II (Group – II Services) in the ratio of 1:10 based on the results of the Preliminary Examination conducted by the Commission on 11.11.2018 FN. The Main Written Examination will be held on 23.02.2019 FN. Those who are admitted provisionally to the Main Written Examination have to pay Rs. 150/- (Rupees One Hundred and Fifty only) towards the examination fee (unless exemption of fee is claimed) and should upload the scanned copy of documents in support of the claims made in their online application from 24.12.2018 to 10.01.2019 in the e-seva centres run by TACTV. List of designated e-seva centres is available in the website. The details regarding the documents to be uploaded will be made available in the Commission’s website and candidates will be informed of the above fact only through SMS and e-mail. Individual communication in this regard will NOT be sent to the candidates by post. Their provisional admission to the Main Written Examination is based on the claims (viz., Date of Birth, Religion, Community, Gender, Educational Qualification, Technical Qualification, Ex-servicemen, Destitute Widow, Differently Abled and PSTM Status etc.,) made by them in their online applications. Any false claim made by the candidates will be viewed seriously and penal action will be initiated by the Commission against them besides rejection of their application. 1. Mere inclusion of the Register Numbers of candidates will not imply that his/her candidature has been fully considered for Main Written Examination. 2. The candidates whose Register numbers are found in the above list have been admitted provisionally to the Main Written Examination based on the marks obtained by them in the Preliminary Examination and with reference to the rule of reservation of appointments in 1:10 ratio. However, with reference to para 10 of the Commission’s notification, the candidates who have secured the same marks as that of the cut-off marks of their respective reservation groups have also been admitted to the Main Written Examination though the number of candidates exceed 1:10 ratio in the reservation group concerned. 3. The admission of candidates to Main Written Examination is provisional subject to verification and acceptance of their claim in their online applications towards age, educational qualification, technical qualification, religion, community etc., whenever necessary. If any of their claims are found to be false or incorrect, their candidature is liable for rejection at any point of time. 4. The candidates who have appeared for the Preliminary Examination and whose Register Numbers are not found in the above list have not been admitted to the Main Written Examination. Separate communication in this regard will not be sent to those candidates. 5. The admission of the above candidates to the Main Written Examination is purely provisional subject to the decision of the Commission and subject to the outcome or final orders to be passed by the Hon’ble High Court of Judicature at Madras in WP No. 26726 of 2018 and other WPs relating to this recruitment, if any, pending on the files of the Hon’ble High Court, Madras / Madurai Bench of Madras High Court. 6. Candidates who have been admitted provisionally to the Main Written Examination are hereby advised to upload the scanned copy of all the relevant documents without fail. Failure to upload even any one of the essential documents will result in their non-admission to the next stage of selection. Candidates competed for the TNPSC Group II examination must get the required cutoff marks/qualifying marks in the examination to clear off the test. The cutoff marks will be announced by the organization based on the number of posts announced, number of competitors clashing for the posts and various other factors. Candidates must get the cutoff marks section-wise and category-wise to clear the written test round. Candidates qualifying the examination with minimum cutoff marks will be listed in the merit list. Candidates must note that TNPSC will announce the TNPSC Group 2 result, cutoff marks, and merit list soon. Keep checking the official website, tnpsc.gov.in to check the result. How to Download TNPSC Group II Exam Results 2018 Online? Candidates have to visit the Tamil Nadu Public Service Commission website, tnpsc.gov.in first. In which, search for ‘TNPSC Group II result 2018’ link and tap on it. TNPSC CCSE II Result, Scorecard will be downloaded on the screen. Also, the aspirants can check TNPSC Cutoff marks, and merit list over there. 1.2 How to Download TNPSC Group II Exam Results 2018 Online? How to know individual Mark?? Is there any chance to clear prelims? Shall I prepare for main exam? 149 bc female. Is there any chance? Is there any possibility to get selected for the next level?